Today I did my very first ever INvisible mend. Technically not for the Visible Mending Programme, but hey, exceptions make the rule. During my last visit to Belfast, I ended up in a secondhand clothes shop, despite having implored upon my partner earlier that we were not to buy any clothes during our visit on account of overflowing suitcases. So when I tried on this gorgeous herringbone tweed jacket, I conscientiously put it back on the rail. Even if it was a Donegal Mist tweed jacket. Handwoven. By a J.F Maguire. As the fibre content contains mohair and cashmere it will not surprise you to hear this tweed is soft and has a great handle. The fact that it not only tells you about the fibres making up the fabric, but even tells you who wove it, is something that makes my heart sing. And I think anybody who supported Wovember last year will agree with me that this is a jacket with provenance and honest cachet. 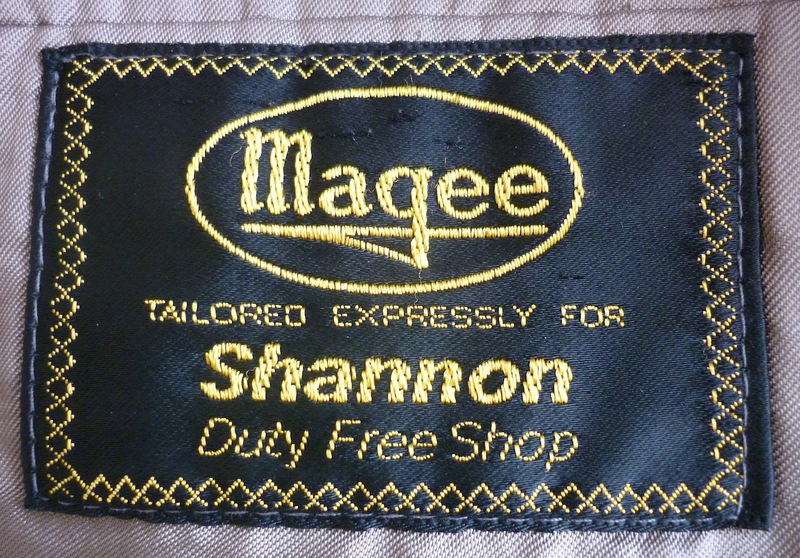 Another label inside the jacket shows it was tailored by Magee expressly for Shannon [airport?] duty free shop. 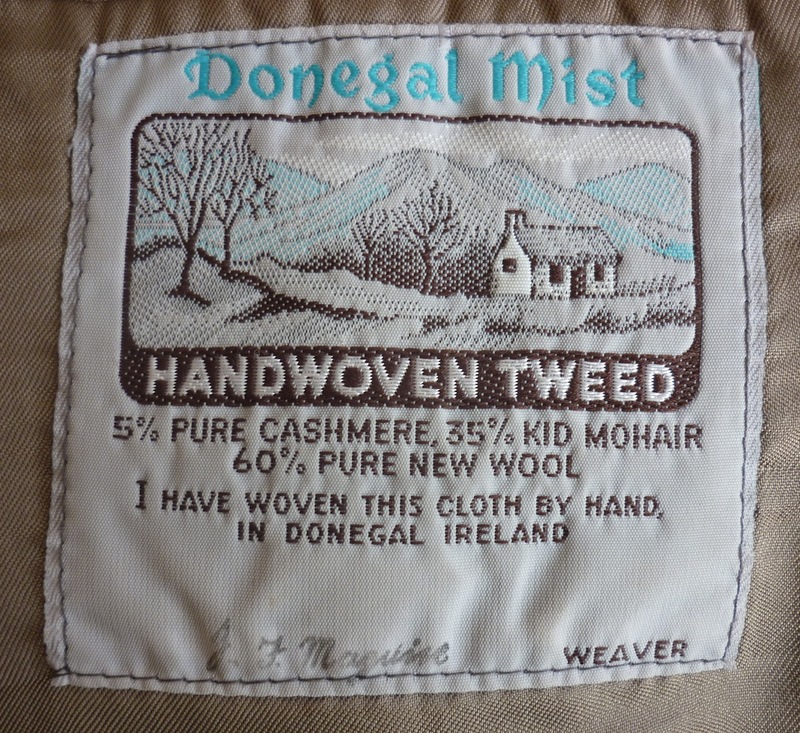 Browsing Magee’s website shows the history of the company and how they have been producing tweed since 1866. I think you will have worked out by now that the above pictures were not taken in a secondhand shop. Indeed, I managed to squeeze it into a suitcase and brought it home. However, when I tried it on again, I discovered a small hole on the back. 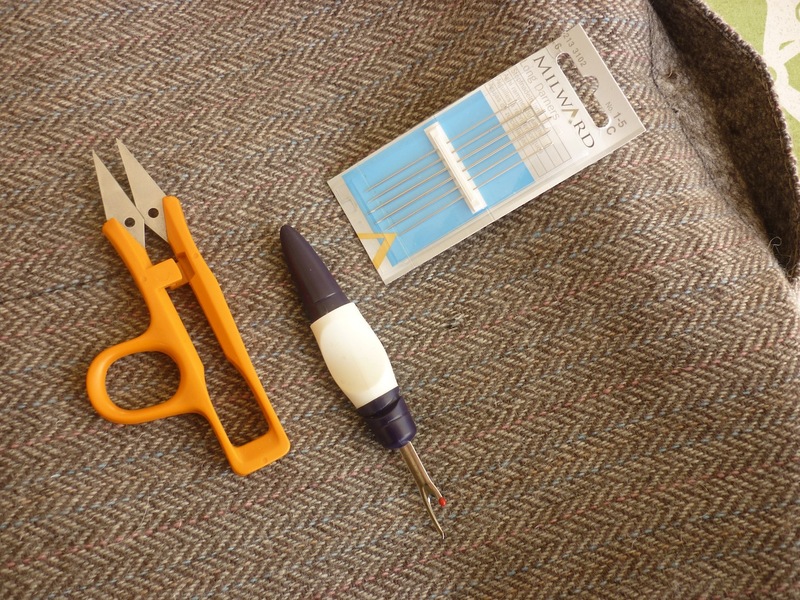 As you can see, you don’t need many tools for this: scissors, darning needle, and an unpicker thingie. With these tools, one harvests some threads from an inside seam and uses these to reweave the hole closed. 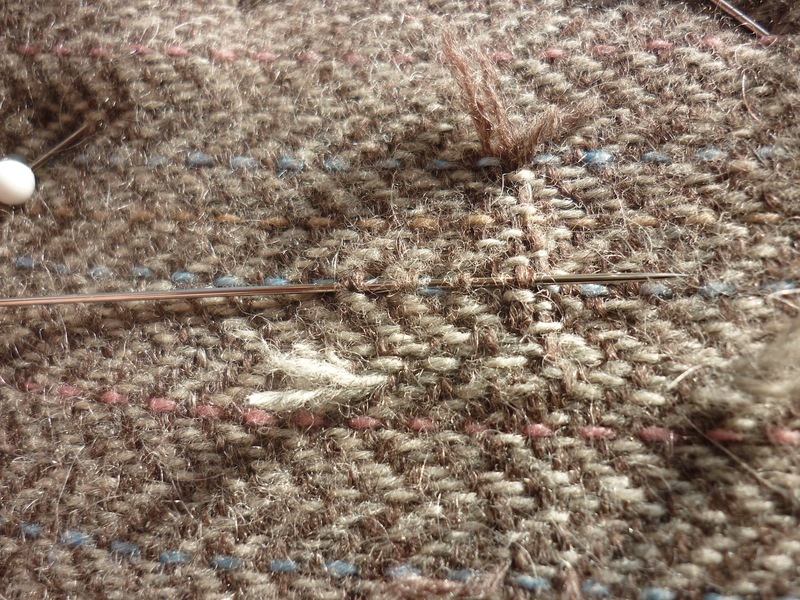 I started with unpicking the lining in a corner, so I could unpick some warps and wefts from the tweed fabric edges. You then painstakingly weave these strands into the fabric, following its weave and replicating it over the hole, working on the right side of the fabric. I was too excited to take a picture halfway through, so the following picture shows all threads already in place, but I have woven in the needle so you can get an idea of how it’s done. After all this work, you slightly pull on the ends and snip them off really close to the fabric. The yarn ends nestle themselves into the fabric and all that’s left to do, is press the treated area from the wrong side in order to set the weave. As you can see, the end result is perhaps not entirely invisible, but practice makes perfect. I now really understand why this repair is so expensive. However, next time I see a nice jacket in a secondhand shop I shall inspect it carefully, hope to find a hole, haggle on the price and buy it with the knowledge that each invisible mend I do will give better results. Nice work – and a lovely jacket. Thank you. It’s an encouraging result! Great jacket! What a find. What I have done when mending kilts with this technique is to give the fabric strong tugs along the bias in all directions. That seems to even out the weave even more. And use LOTS of steam – and a clapper (which is basically just a block of hard wood (mine is oak) that you beat on the fabric from the top while it is damp and hot. Use a tailor’s ham underneath if you have one, if not, use a thinish turkish towel on a hard surface. What you are trying to do is replicate the way that the original fabric was fulled/finished so that the tension on the mend is identical to the tension in the rest of the fabric. Threadbndr, thank you so much for the additional information, as the article in Threads Magazine does not explain any of the finishing techniques after the reweaving is completed. By the way, what is a turkish towel? A thick bath type towel, not a thin cotton dishtowel. You need a bit of padding. 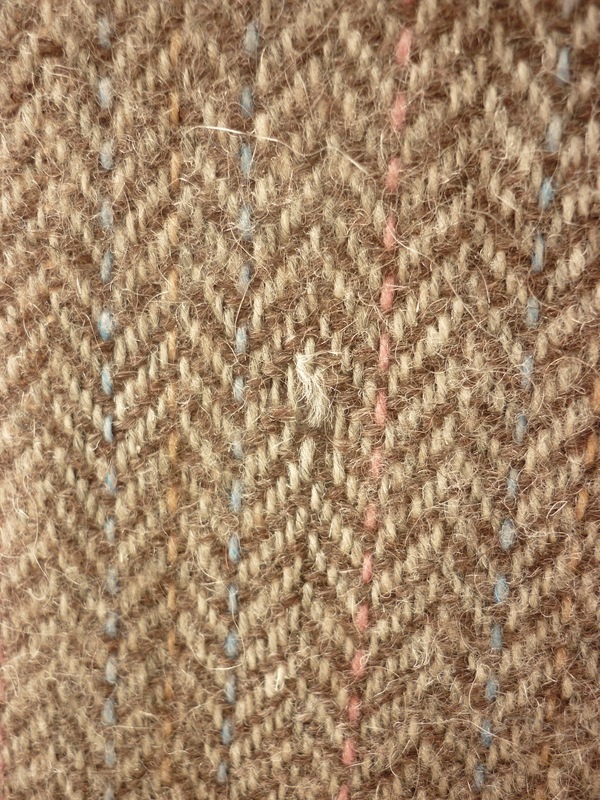 Check out the ways that the tweed weavers ‘fulled’ or ‘finished’ their cloth when it came off the loom. Recreating those conditions is what will ‘seat’ the mend down into the original fiber. I’m afraid I don’t know, but I believe it’s in the region of £50-80 for a moth hole. 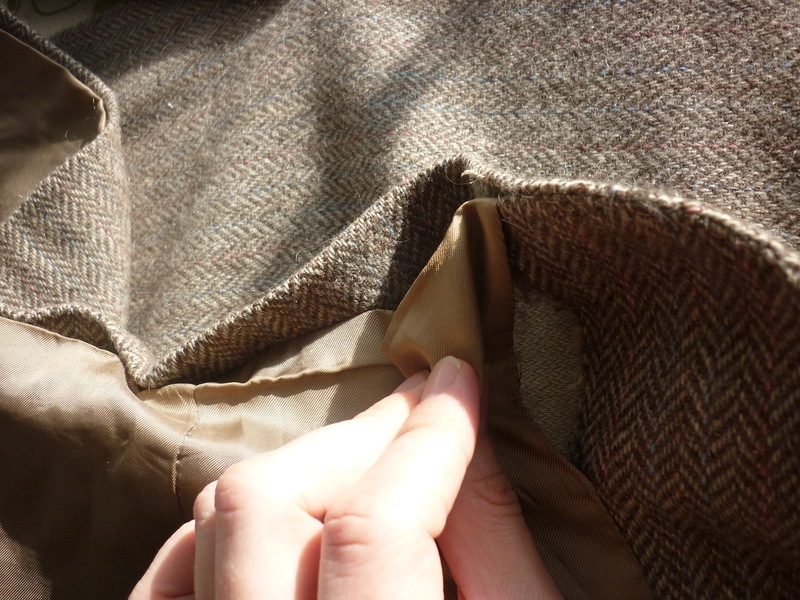 Great repair, I have a herringbone tweed jacket that needs a couple of buttonholes to be hidden (taking up the sleeve) and wonder if this technique could work? I think it could, but practise first, as it’s not an easy technique. You may need to unpick the buttonhole “binding” to make it more invisible. Many thanks excellent feature. 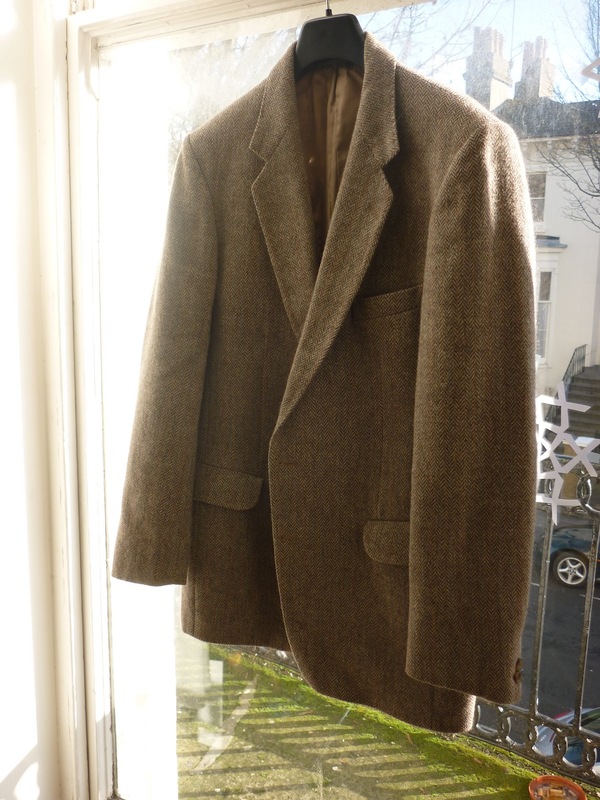 I live in New Zealand & after trawing ebay I searched Donegal looking for a used 43″ pit to pit donegal tweed jacket. Cannot find one! 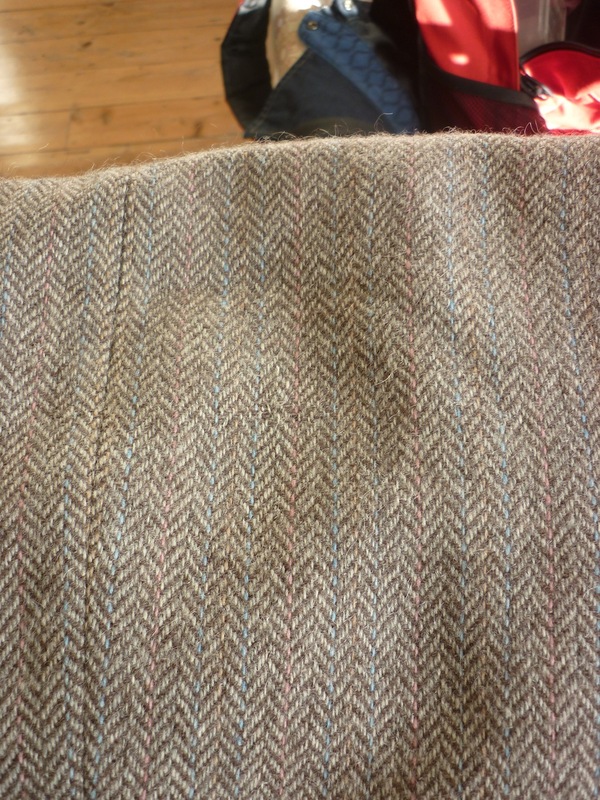 Gorgeous tweed and a lovely mend. The reason why I love cold weather is the necessity of wearing woolens, tweeds and snuggling under wool blankets. Today in southern Ontario it is hot and humid; temps of 34C and a humidex reading of 44C.